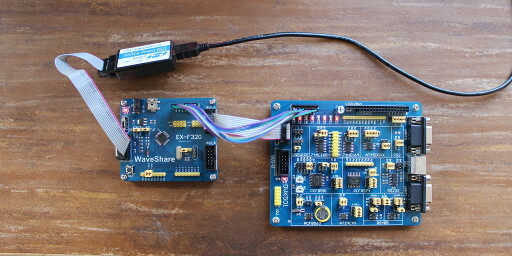 This short tutorial is about a simple LED and timer demo for the Waveshare EX-F320 Premium board. The author used a Debian GNU/Linux system, but the tutorial should work for other Linux distributions, *BSD or other Unices. The EX-F320 is connected to the host computer via a U-EC6 to supply power and to write the demo onto the board. For LED output, we use the DVK501 board. The BUS-A connector only serves to supply the DVK501 with power. For data, we use jumper wires between the P1 connector on the EX-F320 and the L connector on the DVK501. Assuming the board is connected to a U_EC6 attached via USB, ec2writeflash --port USB --hex led.ihx --run will write the demo onto the board. It will run and count up to 255 on the red LEDs, then start again at 0.